KUA empowers communities to improve their quality of life through caring for their biocultural (natural and cultural) heritage. Our vision is ʻāina momona — abundant and healthy ecological systems in Hawaiʻi that contribute to community well-being. KUA has pursued this mission since 2003, first as the Hawai’i Program of the Community Conservation Network (CCN). That same year, KUA and several partners responded to a vision of Uncle Mac Poepoe of Hui Mālama o Mo’omomi (Moloka’i) to bring together practitioners from around Hawai’i to build relationships and share knowledge about community-based resource management. The first gathering, held on Moloka’i, involved 12 communities. From that initial gathering, a learning network called E Alu Pū (Move Forward Together) was born. 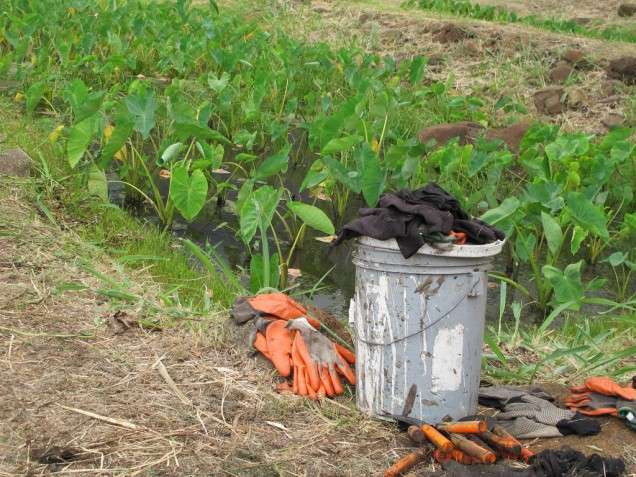 In 2009, the CCN Hawai’i Program became an independent program called the Hawai’i Community Stewardship Network (HCSN), which continued the work and mission. In 2011, the advisory board and staff of HCSN underwent a process with other supporters to formalize the work of HCSN and pursue the formation of an independent organization. In 2012, HCSN became Kuaʻāina Ulu ʻAuamo, and in 2013 secured independent nonprofit 501(c)(3) status. KUA and the E Alu Pu network are celebrating their 10th anniversaries in 2013. Over the last 10 years, the work of those involved in this initiative has connected over 587 individuals and brought over $1.3 million in direct investment to community projects.